At present, it is really amusing to strive to think what the planet looked like lots of years ago, while Alligators, dinosaurs, pterodactyls and brontosauruses inhabited the earth planet. There are many films tell people what the dinosaurs actually looked like but watching T. Rex original skeletons at the museums is a way cooler. So, we though to help you to draw cute Baby Dinosaur drawing cartoon for kids. Using article, you can draw Dinosaur face, full body, Head, skeleton etc drawing step by step. If you want to immerse yourself into an excellent world of tall plants and giant reptiles of the great Jurassic period, you can draw an accurate dinosaur drawing image. If you face any complexities while drawing a dinosaur, you can follow these guidelines that make the drawing much easier. It is simpler to sketch a dinosaur slowly, step by step. The first step is to draw proper outlines by using a pencil. Along with this, you can also draw the landscape as well as other animal species around the dinosaur. It is an excellent trick that let you bring a natural look to your drawing. When you decide to draw a dinosaur, you can follow these simple steps. You can draw the oval-shaped body as well as 2 tiny rounds for the ears and head of the dinosaur. Along with this, you can also draw the small tail on the lower portion to make an initial outline ultimately depict the original structure of the dinosaur. You can draw 3 circles which are central from each other exactly under an oval-shaped body. These rounds will be an essential mark for your drawing so that you previously recognize the leg placement. Now, you can draw the legs of your dinosaur. The above diagram brings you a clear idea to complete this step properly. It is important to note that the drawing of dinosaur tail will be very easy. For this reason, the tail can be considered as the simplest portion of this wonderful drawing. Drawing the head of the dinosaur is not an easy task because it requires additional efforts. If you want to draw your dinosaur’s head easily, you can simply add 4 lines and erase every tentative line. The dinosaur’s head is now ready. 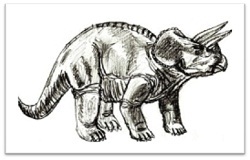 In this step, you can draw the remaining portion of a dinosaur that becomes very simple. Initially, you can remove each and every guiding line. You can maintain it to be more precise and never erase the essential lines. The dinosaurs truly come in various sizes and shapes. The above diagram comes with horns. You can add the horns as well as some additional details to the snout of your dinosaur. It is an essential stage. In this step, you should properly work on precise details of the skin of your dinosaur. After that, you can add claws to feet and sketch the eye apple. These kinds of dinosaurs have the horny excrescence on their back. You can simply draw the parallel lines along a reverse portion of the dinosaur. Along with this, you can also add few perpendicular strokes. It is vital to note that there are many skin folds, mainly under its feet. This is not vital to sketch it. But the dinosaur drawing looks more accurate if drawing these folds. You can add the shadows which add an excellent 3D effect to your drawing. Additionally, you can paint the dinosaur in various colors. It is significant to sketch the landscape of Jurassic period. You can add certain drawings of other animal species in its background.